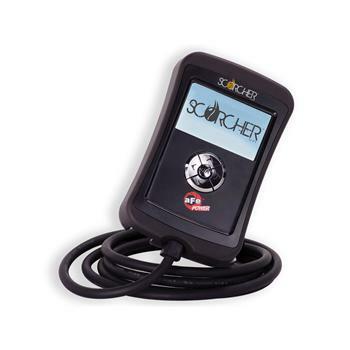 aFe SCORCHER Programmer - Dezod Motorsports Inc - Home of the automotive performance enthusiast since 2002. Finally a programmer that is integrated to work with aftermarket performance products. The new SCORCHER from aFe Power utilizes a fully integrated tuning system that is matched to aFe Power performance intakes, exhaust and manifolds. These tunes are designed to provide maximum performance over the entire RPM range. aFe has partnered with Superchips to develop the exclusive tunes to maximize all available power without sacrificing safety to the motor. This small hand-held unit contains multiple tunes per application that can be changed to match the driving condition (performance, mileage, towing, etc.). The easy to follow prompts make this product one of the easiest and fun ways to increase power and improve drive ability. Amplify fuel delivery and injection timing for increased horsepower and torque. Speedometer Calibration resets for large tire and gear changes. Maximize control of turbo boost and variable vane control. Optimize shift times and patterns for better placement of available power. Read and clear check engine lights/codes.